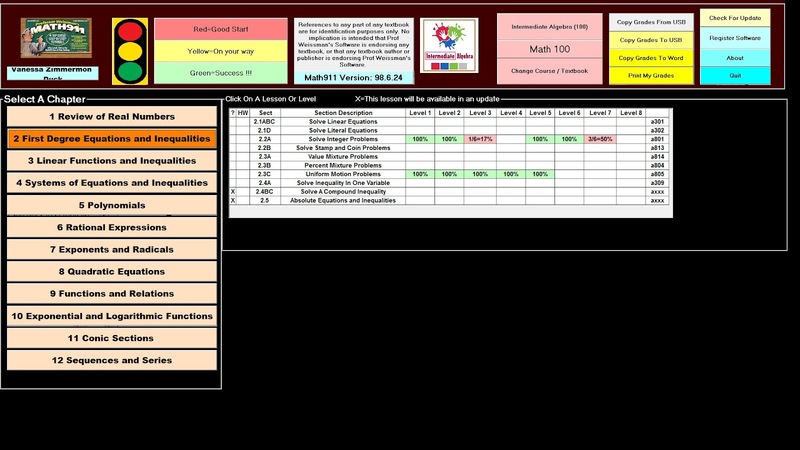 Math 911 is a step by step tutorial for beginning through intermediate algebra. It is an downloaded program that guides you through the tricks of algebra for either a student who is struggling or a homeschool parent that may need a refresher course. This program requires a download to access and then you will be able to get to it directly by clicking on the Math911 button on your computer's main page. Professor Weissman is available for tech support as you maneuver your way around the download. I had a 'cheat' sheet to tell me exactly what to do and I was thankful as I am surely not techy in anyway. This is what a sample menu looks like when you are on you have your student all lined up. Very basic set up, no bells and whistles. Actually reminds me of some of the computer type programs I utilized in school in the 80's. Algebra is the focus here, not the graphics and excitement. Though for a child that is into video games, and inundated with the graphics, this was a bit boring for them. Who said Algebra needed bells and whistles though? 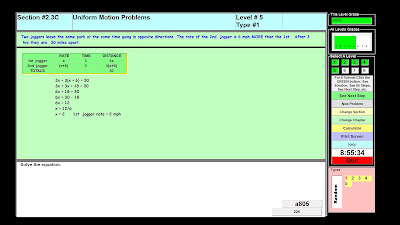 You can easily maneuver around to select the chapter and subject specifically that you need aid in. I liked how the program was broken down into individual algebra components so that if a child was struggling with exponents, but doing well with graphing a slope, they can choose which section they may need more help on. I am amazed that this program covers such a wide range of math topics. I have a son in Algebra 1 this year, though he did take Pre-Algebra last year. We switched programs to try to help him understand the Algebra basics, realizing how important it is for the rest of your math career. I also have a son taking College Algebra. Having the ability to look over problems in a very specific subject area is very helpful. My oldest was studying for his ACT and it was good for him to just get his brain engaged by doing a few random problems. There are 2 programs you can use with the Math911. (Algebra 1) and can be downloaded from www.math911.com. This is a FREE course from Professor Weissman for you to look over and evaluate. No credit card nor Rebate required. There is also the availability of this program on a flash drive, Algebra in a Flash. It gives you the mobility to take it from the student's laptop to the home computer and more. $40 off special right now and you can get it for just $9.95!! What a super deal. I love that you do not need internet access to run this program, so you can just take it and go and not have to worry about Wifi being there. Each course has 2 midterms and finals available for your student. I think those could be helpful for studying for the ACT or SAT, or even as a supplement to your current math program. My 11th grade son started this program and quickly became bored. I pushed for him to do more and he did, but the program was just not working for this specific child. He has been spoiled with watching DVD's that show step by step how to come to the answer, along with the teacher on the DVD speaking through the entire process. I personally do not see this as a teaching program, rather a drill style program. The problems can be seen step by step as in this picture. I was able to help walk my son through the steps as he took on harder problems to help me in the review. It is very helpful to have this component. Professor Weissman has put alot of time and experience into this program. He goes above and beyond to be available to those who need any kind of help with the intstallation, the problems, or anything related to the Math911. His customer service is outstanding! I strongly recommend that you download the free beginning algebra program and use it with the student you may be interested in using it for. Have them get a feel for it and then decide if it is clicking. I think that this program for the right student would be wonderful. It is very well thought out, super organized, and detailed. It just wasn't a good match with my student. As a TOS reviewer I received the premier download of Math911 in exchange for an honest review.